Size is important. For techniques like these you can only really do them justice when you go big. So what better way to show off the majesty of what enamel paint can do than this magnificent thing. And there’s no mistaking it for anything but. It’s colours are big, the shapes are big and the overall impact is, well, big! 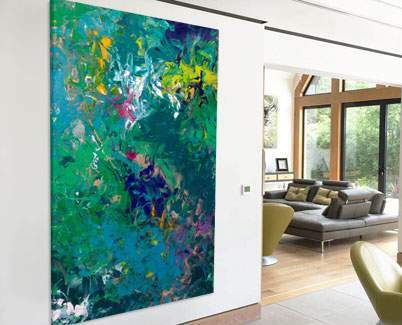 Let’s be honest here, if you have a wall space big enough then the chances are that the rest of your room is going to be of an equally grand nature. 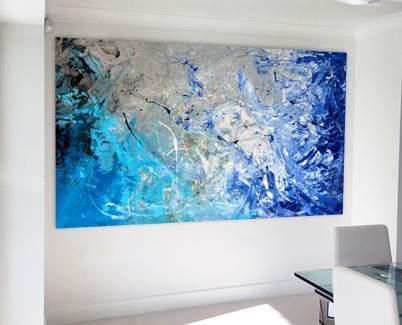 Filling large empty spaces (with anything) can be tricky but finding a painting that can not only cover it and fill it but also make you tingle every time you walk past it can be almost impossible. After having worked for months on things like my cutting-edge carbon fibre artworks I have finally begun creating a series of large format paintings that are deliberately imposing but also very well behaved. My plans include all colour themes, and a lot of different styles, but they will all carry the same qualities – impact, maturity and depth. 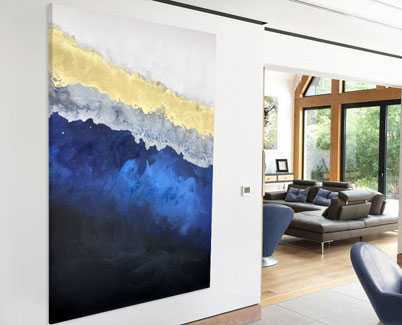 Hemispheres is the first completed painting in this new ‘big series’ and is the prefect combination of ying and yang for almost any large wall space. 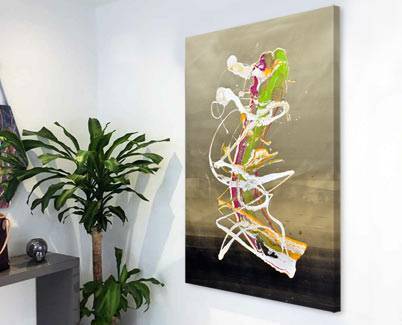 With this canvas I wanted to contain the dancing abstract paint shapes into a central mass – leaving the edges white to give everything some much needed room to breathe. So far so good. The colour choices were led by a client of mine who had asked me to paint for them using this beautifully balanced selection of light and dark. In here you’ll find a couple of dense, rich blues and two very subtle pinks. Added to this are the purple colours (three in total) and these work so well because they act as a bridging point between blue and pink. I wanted to avoid the harshness of these colours as they met each other so I used purple as the link between them. Works like a dream. It calms everything down and creates warmth at the very heart of the painting. Finally we see hints of other colours like gold, black, silver, turquoise, cream and white. Good lord! Where do I begin? I pretty much think that they’re all in here somewhere. I even used a dragging technique on the background layers to move the base coat around so even the linear movement methods get a look in. These movement type paintings are rather difficult to get right. They require patience and a steady hand and they’re very easy to overwork and destroy. Everything revolves around balancing each component and very flick of the wrist or drop from a can. As in most of my work there are always elements of light and dark. Balancing these out is always a challenge for me, especially if I am deliberately trying to do something that favours one over the other. But with Hemispheres I had to be aware that I was dealing with such a large expanse of canvas that I couldn’t afford to be too heavy in any one place otherwise that would become the main focus of your attention and you’d miss the rest of the epic stuff going on. So the ability to keep your eyes moving around depends on balancing my shades carefully, keeping white space where I need it and using techniques to contain the madness so that it doesn’t make you ill. This is perhaps most evident in the two large areas of dark blue in the bottom left and top right hand corners. They are there to push everything into the middle and stop things from disappearing off in to the sunset. Preparation: Two coats of primer, one additional skim coat, one blended base coat.